The Older Persons' Commission (OPC) addresses the needs of older persons, 50+, regardless of income, race, religion, nationality, physical or mental disability. What Does OPC Do for the Community? OPC, through the Meals on Wheels Program, and the generous assistance of many volunteers, prepares over 575 meals for the homebound and other seniors - an average of 187,000 meals are served yearly. 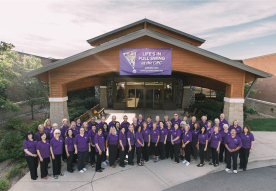 OPC ensures a safe and accessible location for senior members of our community to meet for social, educational, and healthful pursuits - an average of 78,300 seniors yearly. OPC contributes to the well-being of our community by providing adult day care services for those with Alzheimers and other conditions related to aging - an average of 28 frail elderly daily. 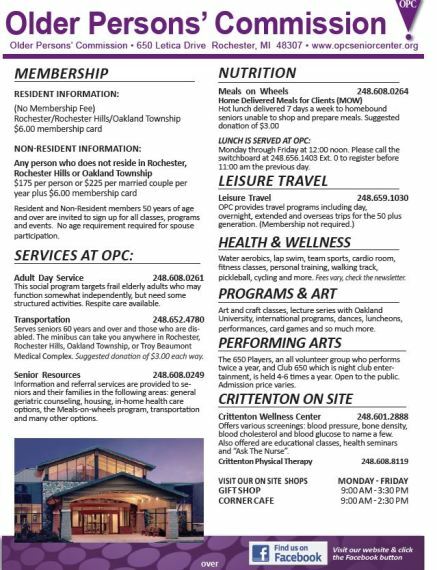 OPC provides quality of life, health and fitness activities in keeping with our mission of promoting a healthy body, mind and spirit for the 50 plus generation. OPC provides Leisure Travel Programs including day, overnight, extended and overseas trips for the 50 plus generation.